The female bear Daniza was accidentally killed by the local authorities using a tranquilizer gun. Her two seven-month old cubs are wandering now without her mother through the forests of Trentino. This bear project URSUS running from 1996 till 2019 amounts to 12 mio Euro through several EU LIFE and other Projects to reintroduce the brown bears into the region. Part of these monies was earmarked for information dissemination on how to behave around bears. Daniza had two seven-month old bear cubs. Young bears stay with their mothers between two and three years during which time she will breastfeed them at least during the first two years and sometimes even longer. The bear cubs learn from their mother everything including safe food sources, building a den, protecting themselves from predators and the mother bear also cleanses them from parasites. The average mortality rate in the Trentino bear population is 27% with the mothers being present. Everyone realises that the two cubs will have a much lower chance of survival. Evidence indicate that Daniza and her cubs encountered a hiker a few days earlier. The hiker followed her while she tried to distance herself from him, which she eventually managed. A few days later on the other side of the mountain where the first incident happened a second hiker collecting mushrooms surprised her and her cubs sleeping. Daniza attacked and non-lethally injured him. All experts within the regional authorities as well our own Expert Gudrun Pflueger agreed, that Daniza’s behaviour was thus normal and that she should not be classified as a problem bear. Regardless of this assessment, the actions taken against Daniza were in accordance to the rules and recommendations of the Italian protocol for bear management (PACOBACE). The European Wilderness Society just like CIPRA and other NGOs do not agree with this procedure at all, especially since it is deviating from most others international bear management protocols. The Italian animal rights organization LAV invited the European Wilderness Society to meet with the regional authorities on Thursday for two hours and both proposed a discussion process to modify PACOBACE to align it with international bear management standards. During this meeting Dott. Romano Mase and Dr. Claudio Groff, as well as everyone else present, agreed that a second Daniza incident must be prevented. Their was a general understanding that a multistakeholder series of workshops would be good opportunity to provide additional input to revise PACOBACE to international standards. There was also an agreement that the output of this discussion process should include an information and dissemination strategy to minimise human and wildlife encounters and that another objective, should be the development of an ecotourism strategy focusing on the successful bear programme. Dott. Romano Mase promised to discuss the idea of such a workshop internally and inform us of their decision very soon. Indeed: the word “incompetent” is correct here! What stupid people are in the environment of the bears! They don’t have any overview in the region and I only can agree with the questions Dario Botti – up here – asked. So very sad, these 2 cubs now without their mother, wandering around! Trentino is a very popular region for tourism. I guess that this absurd fact (the killing of a bear mother of two cubs!) is due to the fear of losing tourists. Perhaps it will get the opposite effect. In my mind, I have many questions. Is it correct to consider a bear with maternal instinct a problematic bear? 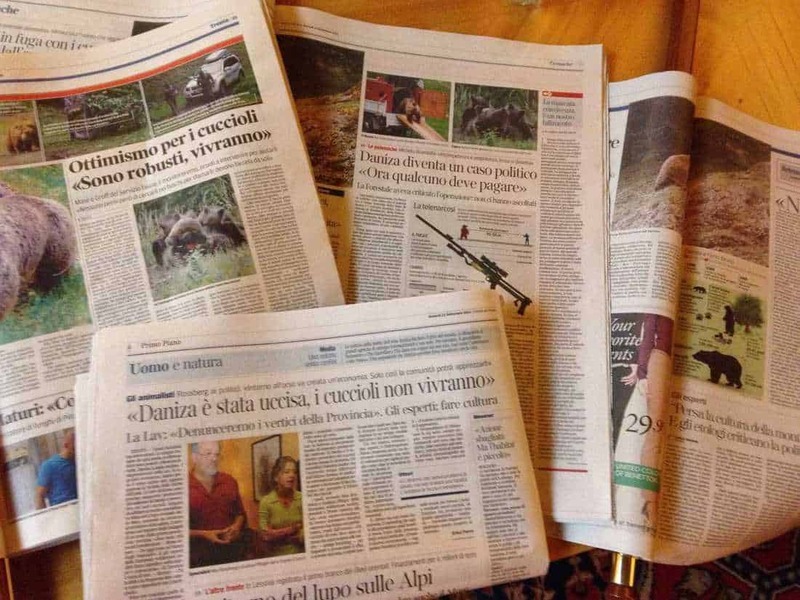 Is the current way the scientifically and ethically correct way to manage bears in Trentino? Is it correct to spend public money for bears and then kill them? Does Trentino really want to be a Bear Country? Or bear repopulation was just a greenwashing operation like many others? thsi is very very sad indeed; wand very bad management of what should not be a problem at all! What people are they, those officials that made this tragic and stupid decision? In competent.